Are you ready to own a part of the Outer Banks? Do you dream of owning a beach house? The Doshier Team can take your dream and make it a reality. 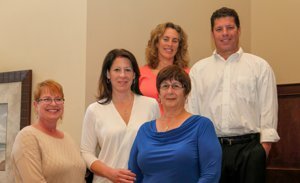 With over 30 years experience assisting buyers and sellers, Rosemarie Doshier and the Doshier Team have the real estate expertise and commitment to help you find a home you and your family will love, saving you time and money in the process. Rosemarie Doshier is active at the local, state and national levels of the Realtor Associations as well as the Dare County and OBX community. Through additional education during her real estate career she is certified in Short Sales and Foreclosures. Rosemarie holds designations in ABR, CRS, GRI, PMI, RRS, Recreation and Resort Sales Council and Women's Council of Realtors. Whether buying or selling, we're here to help make your transition as easy as possible. Contact the Doshier Team to achieve your dream of owning a beach property. The Doshier Team specializes in single family homes, investment homes, rental income producing homes, condos, and even boat slips. From Corolla to Hatteras we are here to welcome you home and put the Outer Banks in your lifestyle!